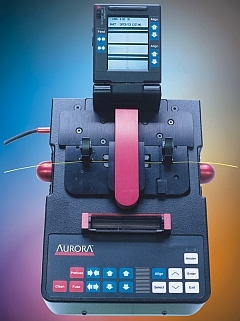 Aurora Optics introduces Profile Alignment System (PAS) with a difference: incredible speed. Using sub-pixel image processing, the most advanced single-board computer and frame grabber, and two simultaneous views of the fibers, the Fusion 3000 can inspect fiber ends, gap, align, splice, and make splice loss estimate in just 8 seconds. Overlapped fibers are corrected easily. Its vast memory can store results from up to 1000 splices for downloading, and it can accommodate up to 100 fiber program profiles, either factory-installed or user-developed. It comes in attractive and compact packaging, with battery, charger, built-in heater (or UltraSleeve closer), and many other accessories.